Like all good blues albums, it uplifts. Like Woody Guthrie, Hank Williams, Bob Dylan, and other practitioners of the art that the album invokes, Earle has got a sly sense of humor and the sense of the trickster about him. It takes balls of steel to write country blues about the Harlem River, living in Brooklyn, and working on the Manhattan subway line as if one were singing about rural life in the Appalachian hollows. 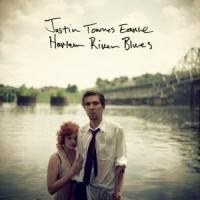 Justin Townes Earle confidently writes and performs these 10+ songs as if he’s singing about life back in Tennessee instead of the Big Apple, and does this so damn convincingly that you believe him. It’s a neat trick, and a tribute to Earle’s artistry that he does this so well. When Earle sings in a throaty voice to the rhythm of a steam engine chugging down the tracks that he’s going uptown to drown himself in the dirty water of the Harlem River, he connects to a tradition that goes back to Leadbelly and before -- a time when suicide by water was a spiteful thing to do. And Earle might know the Metropolitan Transit Authority is not his daddy’s railroad, but he also understands the tunnels are as cold and dark as those down South. Earle persuades the listener that hard times are hard times, no matter where or what era one lives in. Suffering is a universal truth. But HArlem River Blues is no downer. Like all good blues albums, it uplifts. Like Woody Guthrie, Hank Williams, Bob Dylan, and other practitioners of the art that the album invokes, Earle has got a sly sense of humor and the sense of a trickster about him. His complaints are just a way of telling you he shares the burden of living with the rest of us. He might know what it’s like to work hard, as he tells us through the Memphis-style horns of “Slippin’ and Slidin’”, but he also knows the small pleasures of waiting; and of conversation and smoking cigarettes with a pretty gal, as on the jaunty nighttime sojourn of “Christchurch Woman”. The details keep things real as he observes the people and his surroundings and tells us how he sees things. Earle also knows enough to keep on moving, whether he’s singing about being a lonesome traveler in “Wanderin’” or just someone who can’t stay still as in “Ain’t Waitin’”. This keeps the music lively as well, because one can’t sing about being stirred up without tapping one’s feet. While Earle grounds his instrumentation in Americana roots’ styles, this album sounds distinctly modern because he constantly changes the tempo and builds thick grooves. Even when he’s singing about killing himself, you can dance to the beat. For this reason, Bryn Davies' jumping stand-up bass lines are especially noteworthy, but all the players here (including guest appearances by Calexico’s pedal steel player Paul Niehaus, and a gospel choir) contribute to Harlem River Blues’ timeless, classic sound. The distinctions between urban and rural disappear when an album so thoroughly connected to the Empire City feels more rustic than anything coming out of the Volunteer State. Earle brings the realization that we all live in the same interconnected world and share matching roots as Americans no matter where we are from. That he does this so eloquently and with such zest; well, that’s just like putting red eye gravy on a New York strip steak -- mighty tasty!